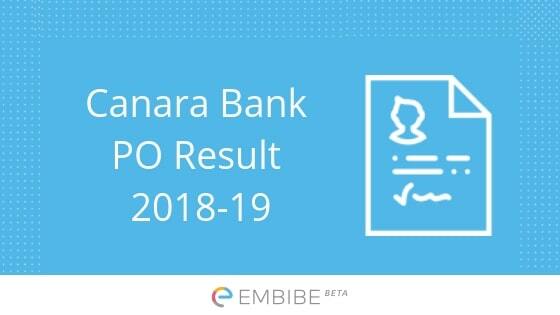 Canara Bank PO Result 2018-19 | Canara Bank has released the result for the online exam which was conducted on 23rd December 2018 for the recruitment of 800 probationary officers. The Canara Bank result is released as PDF which consists of the list of candidates who have got selected for the interview. Candidates can visit the official website and download the PDF file. Candidates need to refer the PDF file to check whether they are have got shortlisted for the further round or not. The PDF clearly mentions the registration number, roll number, and name of the candidate along with the registered category. The shortlisted candidates will be called for a Group Discussion and Interview. We have provided a direct link to download your Canara Bank PO Result 2018-19. Go through the article and get all the information regarding Canara Bank PO Result here. Step 2: Click on the “Careers” tab available. Then Click on “Recruitment”. Step 5: A PDF File will open mentioning the list of candidates who have been shortlisted for the Group Discussion and Interview. Step 6: Press Cntrl+F and enter your roll number to check whether your roll number is present in the document or not. Step 7: Download and take a print out of the result for future reference. As the results for the online test is released get ready for the upcoming Group Discussion and Interview. The bank will be providing mo details regarding the Interview date and schedule on the official website shortly. We wish you Best of Luck! for the Canara Bank Result 2018-19. We hope this detailed article on Canara Bank Result 2018-19 helps you. For any query related to Canara Bank Result 2018-19 or the exam in general, drop a comment below. We will get back to you. All the best! when the result will be declared….? when canara banko po result is gng to be declared plz tell me. Canara bank 2018 when the result ? Sir I would like ask to you that when will declare the result of canara bank which held in 23rd Dec 2018? Hello Gajanan. The results will be released by the end of January. Yes Shivani, the scorecard for the exam held on 23rd December is available.